We all have our quirky ailments. Some of us have digestion issues, while others are arthritic inflammation and some have a suppressed immunity. Whatever the case may be, there is a simple way to reduce symptoms that go along with these personal ailments. By gently flushing the system on a daily basis with infusions of fruit, herbs and water, you can start taking steps to get your health to the standards you want to be at. Infused detox waters act by gently flushing out toxins and provide you added antioxidants and other health boosting nourishment. As well, many of the detox waters improves immunity and digestive function, cleanses and revitalizes the urinary tract, improves your complexion and curbs the appetite and creates a general overall health and wellbeing. I began making infused detox water so I could get my family away from unhealthy sugar-filled juices and sodas, now it is all they reach for in the refrigerator. 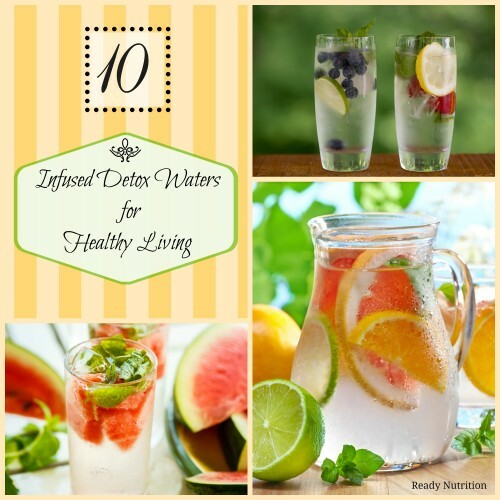 Drinking infused waters are great because they add subtle flavor and a touch of sweetness. Creating fruit infused water couldn’t be more simple either. You can either add all the fruit or herbs to a pitcher and allow it to sit overnight, or purchase a pitcher specifically designed for infusing fruit, like the one. I even have a portable water bottle that infuses fruit so I can enjoy it while walking or driving around town. When making my water, I prefer using filtered water that do not contain fluoride and other harmful chemicals and organic fruits and herbs from the garden. Steering clear of fruits that have herbicides and pesticides will undermine your detox efforts. Try some of these out during get together, spa days with the girls or as a refreshing treat for yourself. Adding a few or all of these to your water will give your detox water more of a punch, so to speak. In fact, making a water from all of these ingredients will create a very effective detox water that will help to suppress the appetite for better weight management, and aid in digestion. Not to mention all of these foods are great for naturally detoxing the body. Lemon – Adding a wedge or two of lemon to your water is great for alkalizing the body and maintaining a balanced pH level. As well, lemon juice helps to break up fat in the digestive tract and gives you an added vitamin C boost. Mint – This aromatic herb is wonderful for helping with digestive issues, as well as adding a nice crisp flavor to your waters. Cucumber – Adding a few slices of cucumber to your water is excellent for re-hydrating the body, flushes out toxins and also contains anti-inflammatory properties. Ginger – The spicy root helps to cleanse and detox your entire system, aids in digestion, settles the stomach and gives your water an exotic flavor. Berries – Antioxidants are one of the first lines of defense for the body to remove free radicals and prevent them from causing a domino effect of damage on other cells. All berries possess these antioxidants and help to keep you healthier. This recipe is favorite amongst those who are looking to suppress their hunger, naturally cleanse the body, as well as help to get you hydrated. All the ingredients combined create a very effective detox tonic that will help you flush out toxins and the refreshing taste will keep you wanting more. Stress can really put a damper on things. Why not drink it away. Pineapple has bromelain that cleanses the bloodstream and breaks down harmful enzymes so that they can be flushed from your body. As well, pineapple has anti-inflammatory properties that helps relieve joint pain and arthritis. Basil fights free radicals and is an excellent source of magnesium so it’s really good for your heart. Apple cider vinegar is rich in acetic acid, which regulates blood sugar levels by slowing the digestion of starch. As well, it also contains in ash, which equalizes the body’s pH levels. Mix ingredients in a pitcher and add vinegar and water. Stir well and set in refrigerator. This flavorful infused water will be the hit at the party and is a great way to quench your thirst. Blueberries and cherries alike are bursting with antioxidants. As well, lime adds a zesty refreshing taste and aids in digestion and removing free radicals in the system. Muddle blueberries and cherries and remove cherry stones. Add ingredients into a pitcher and add filtered water. This refreshing water recipe will aide in any tummy issues you may have – including bloating and help flush your system at the same time. As well, the calming nature of lavender will help you reduce stress. The cucumber will flush out toxins and help to rehydrate, as well as add anti-inflammatory properties to the water. The mint is a flavorful addition that will also aid in stomach upsets. Add lavender, lemon wedges and mint to a tea bag and set in pitcher. Fill pitcher with filtered water and allow it to sit overnight. Because cilantro is so rich in manganese, an antioxidant that helps reduce the effect of oxidative stress at a cellular level, it can rid the body of heavy metal poisoning from elements like mercury and lead. Scientists have even theorized that the outer cell wall of cilantro is ideal for capturing metals. You can use cilantro to purify water by filling a tube with dried, ground cilantro. When the water runs through the tube, the cilantro absorbs the metals. An easier home solution for a cilantro water cleanse is to fill tea bags with dried cilantro. Place the tea bags in water for a few minutes and voila! Filtered water! Out of cilantro? Its rumored dandelion and parsley have the same effect! Read more here. Muddle the cilantro leaves add them to a pitcher. Add remaining ingredients and pour filtered water over them. This detox drink is great for reducing inflammation naturally. All berries pack powerful antioxidant compounds like proanthocyanidins and ellagic acid, which fight inflammation and cell damage. Rosemary is equally helpful with inflammation. A recent study of plant-based anti-inflammatories showed that rosemary significantly inhibits the inflammatory response. It’s also a powerful antioxidant and contains high levels of calcium, iron, and vitamin B6; so drink up! 1. Muddle the berries and rosemary in a bowl. 2. Add the muddled ingredients to a large pitcher. Pour water over the ingredients and stir. Adding watermelon to your water is a great way to flush out toxins from the body because it contains the organic compound citrulline. Citrulline is an amino acid that has been shown to help the liver and kidneys filter and get rid of ammonia. Alternatively, you can use cucumber and gain the same effect. Mint leaves are a refreshing flavor to add to your drink and can help you digest more effectively, improving the flow of bile from the liver, to the gallbladder, to the small intestine, where it breaks down dietary fats. This is one of my kids’ favorites! Slice up watermelon into cubes, and add to a pitcher. If you prefer, add lemon or lime wedges and toss in with the watermelon. Add a handful of mint leaves and pour in 2 liters of cool water, filling the jug all the way to the top. Allow pitcher to sit overnight in the fridge in order for flavors to release into water. Grapefruits are wonderful for aiding with healthy blood circulation, and ginger is a notorious for being an immune system booster and provide detoxifying properties. The cucumbers help to rehydrate and provide additional anti-inflammatory relief. As well, the mint provides relief against any tummy upsets and add a splash of flavor. This is also a great infused water to drink when you are nursing a hangover. Combine all ingredients in pitcher. Add water. Allow the ingredients to sit in refrigerator overnight. . Your liver is the body’s purifier, and keeping it healthy is essential in removing toxins from the body. When the liver is clogged with toxins or excess fats can’t perform its duties and your health suffers, as a result. All of the fruit in this infused water will give your liver what it needs to flush out toxins and provide you with better health. As well, the rosemary has as powerful effect on cleaning the liver and has even been shown by studies to protect the liver, especially with those who are suffering from cirrhosis. In a bowl, muddle cranberries and raspberries. Add apples and rosemary sprigs in a pitcher and add muddled fruit. Pomegranate seeds have one of the densest antioxidant concentrations of any fruit. As well, blackberries and blueberries are highly nutritious and rich in antioxidants. Drinking this infused water will help the skin stay supple and help to remove heavy toxins from the body. Adding a few slices of lemon to this refreshing beverage will help detoxify the kidneys, and promote clear skin. Muddle pomegranate seeds and berries in a small to break up juices. Try some of these infused waters out and you will feel better and enjoy drinking water all the more. when you say muddle up the berries, etc. do you mean to smash them?